So, how do we foster a new Pentecost and a culture of Pentecost so as to create an evangelizing culture of witness within which we might carry out a new evangelization? We pray as Jesus asked before His ascension. We unite as one, holy, catholic, and apostolic Church and pray the Novena of Pentecost from Ascension Thursday to the Eve of the Solemnity of Pentecost, and then we gather with Mary and the Apostles in our local churches (dioceses) and implore God to send power from on high, the gift of God, the Holy Spirit, as Pope Benedict XVI said during his 2008 visit to the United States:“Let us implore from God the grace of a new Pentecost for the Church in America. May tongues of fire, combining burning love of God and neighbor with zeal for the spread of Christ’s kingdom, descend on all present!”(Pope Benedict XVI, Homily, St. Patrick’s Cathedral, New York, April 19, 2008). 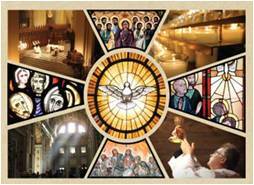 I hope you make this Pentecost special: we are all going to need the extra power as we enter the Year of Faith in the spirit of the Synod of Bishops on “The New Evangelization for the Transmission of the Christian Faith.” I will join Archbishop Gustavo García-Siller, Bishop Oscar Cantú, and hundreds of brothers and sisters from various lay ecclesial movements and new communities for the Fourth Annual Archdiocesan Pentecost Eve Vigil Mass and Celebration, and spend a good couple of hours in fervent and joyful liturgical prayer imploring the Lord for the grace of a new Pentecost for an effective and full implementation of a new evangelization. Find more information on the new Pentecost, the culture of Pentecost, the new evangelization, and the culture of witness in my television series on the Holy Spirit (www.archsa.org/Evangelization – Pentecost), my blog (https://iEvangelize.wordpress.com), and columns (www.satodayscatholic.com/Martha_052209.aspx, www.satodayscatholic.com/052308_Martha.aspx).